These incredible white dresses are perfect for this particular occasion and will also highlight your figure. 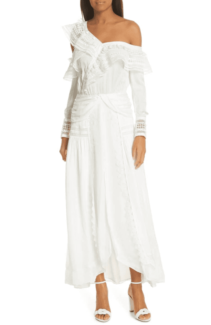 The Augustina white dress by Mara Hoffman is made from a linen blend making it ideal for spring or even summer gatherings. It has a beautifully constructed corset will a strapless sweetheart neckline. 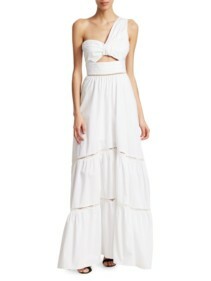 Additionally, it offers an adjustable belt to define your waist and emphasize an hourglass silhouette. 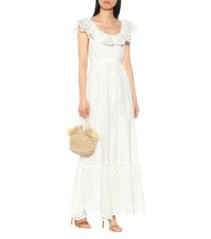 Style this dress with simple sandals to complete this simple and elegant look. 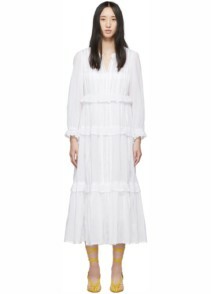 The Penelope broderie anglaise maxi dress by Rebecca De Ravenel also offers a waist belt yet in a contrasting jet black. This draws attention to the waist and also offers and timeless, fitted accent to your look. 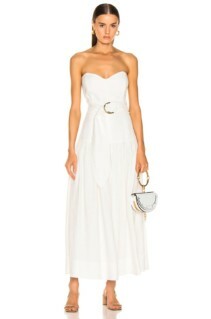 The scoop neck is eternally flattering as is the boned corset bodice. In addition, both the bodice and skirt hem are finished with a pretty scalloped trim hem. We adore the ankle length skirt which provides full coverage without touching the floor. Whether you’re an attendee or the host making your entrance in these luxurious white dresses will certainly be memorable. Choose a style that’s fitted yet floaty and you’ll have a perfect balance of classic and playful. You’ll be simply stunning in the long sleeve one shoulder maxi by Self Portrait. This wonderfully romantic dress combines twisted draping with a stunning one shoulder ruffle detail. This inspiring creation also offers the most delicate lace trims and will move beautifully as you glide into the party. 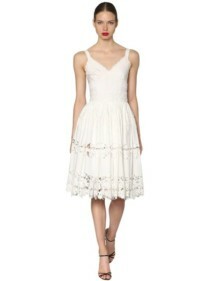 For an alternative yet no less beautiful one shoulder design, opt for the elegant silk organza eyelet dress by Marchesa. 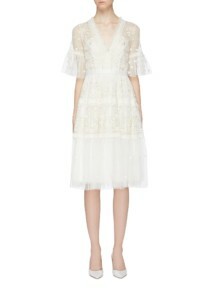 This gorgeous dress is made from ivory silk organza with dainty eyelet detailing. It defines your waist with a contrasting black belt and which also elevates the volume of the A-line skirt. Style this amazing creation with heeled sandals to finish your look.